Time Magazine's November cover featured part of a Hipstamatic iPhone image taken by Ben Lowy. While 2011 marked many milestones for mobile photography (including the explosive growth of Instagram, numerous major gallery showings of mobile photography art, the first major mobile photography conference, the formation of mobile shooter “super groups” like the Mobile Photo Group, JUXT and AMPt, the abundance of mobile images in photojournalism, and so much more) that it didn’t seem possible 2012 could be any bigger for the nascent art of mobile photography. But 2012 easily blows the previous year out of the water with an unprecedented amount of mobile photography events, news and cultural shifts. In fact, so much happened this year that I simply can’t cover it all here. It’s just too much. So instead, I’m going to just go over some of the highlights that got everybody talking. There’s no question that news about mobile images was all over mainstream media in 2012, as outlets such as CNN, the Huffington Post, The New York Times and more covered a vast array of talking points about photos, apps, devices and more. 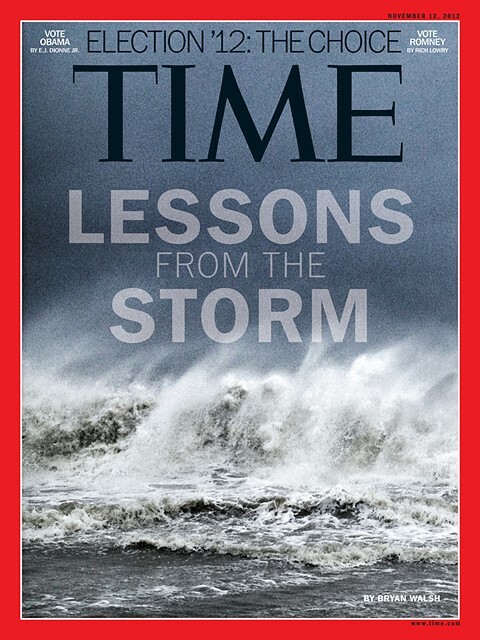 “The conversation about mobile photography finally evolved,” says award-winning photojournalist Ben Lowy, whose own work shot with an iPhone made several headlines throughout the year -- including an image from Hurricane Sandy that made TIME Magazine’s cover. Lowy’s own iLibya project (warning: link contains graphic images) was one of the reasons the photographer was awarded the International Center of Photography’s prestigious Infinity Award for Photojournalism this year. "Untitled" by Richard "Koci" Hernandez. Richard “Koci” Hernandez (a national Emmy-award-winning video and multimedia producer as well as an assistant professor of New Media at UC Berkeley’s Graduate School of Journalism) was another of the many photographers who made headlines this year regarding mobile photography. In a piece entitled “Photographers, Embrace Instagram” for CNN’s Opinion site, Hernandez explained how “the camera phone allows me to offer a small taste of my here and now, on unprecedented levels, to a global audience with astonishing immediacy.” Hernandez also contributed an extensive series of instructional videos for lynda.com called “iPhone Photography, From Shooting to Storytelling” earlier this year, and offered “12 Tips to Become a Better Smartphone Photographer” this September on CNN’s Tech site. Back in 2011, the first-ever Mobile Photo Awards brought in thousands of submissions from people all over the world, competing for some of the biggest prizes yet for a contest involving images taken on a mobile device. Led by "Reservoir" Dan Berman, and featuring a diverse panel of well-regarded mobile photographers as judges, the MPAs also offered exposure for its participants. Various awards were given in multiple categories, but the most appealing aspect of the contest was that the winning photos (as well as additional pieces selected by the judges), made up a multi-part exhibit in early 2012 at venues including the Arthaus Gallery and San Francisco Fine Art Fair, as well as the Orange County Center for Contemporary Art. "Carmella" by Helen Breznik, one of multiple images from the Mobile Photo Awards that sold for over $1,000 in 2012. The MPAs returned this October and closed submissions just two weeks ago -- this time with even more categories, much bigger rewards (such as a $3,000 grand prize) and more ambitious plans for exhibiting participants’ works. While the roaming exhibit was definitely one of the largest to feature mobile imagery, and got plenty of press, there were also many “Instagram Exhibits” around the world that seemed to gain plenty of attention and prominence too -- frustrating many more serious, professional-minded mobile shooters. Many of these pros felt they were being upstaged by “casual users” and hobbyists who used Instagram to shoot or share their images, but didn’t aspire to anything beyond increased social interactions and fame, instead of creating meaningful photography. And the rub was that they were getting exposure not due to the quality of the images, but rather the device they were taken with or the app used to share them. The Instagram boom, and its role in the democratization of photography, spurred many heated debates about its place in the art world during 2012. This author even wondered if the popular sharing app was possibly defining, and therefore ruining, mobile photography back in April. As more and more Instagram-only exhibits got the spotlight (there were simply too many to list them all here), there was also a growing sentiment in the community (mainly through Twitter) that the focus should shift beyond just showings that revolved around a single app, or even a specific device. 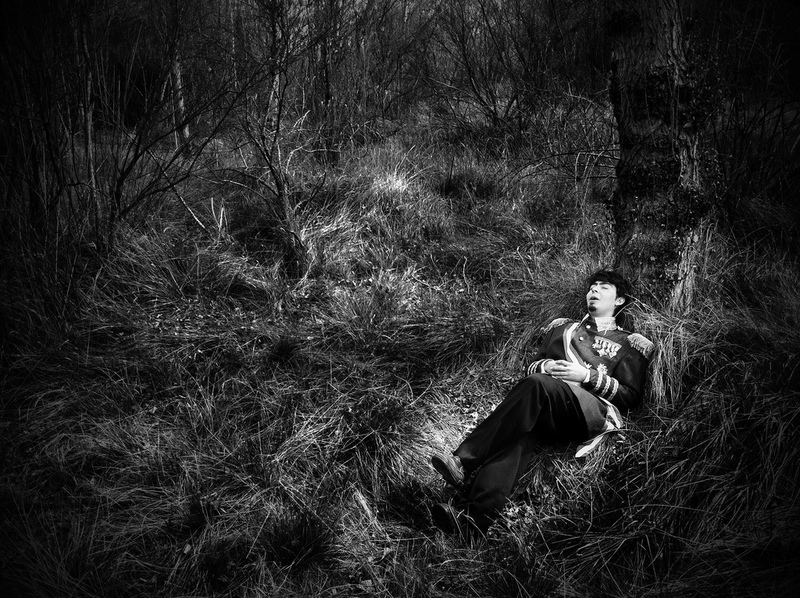 "The Sleeping King" by Jordi V. Pou, one of the many images from his Kokovoko exhibition in Lleida, Spain. Following the formation of mobile photography collectives such as The Mobile Photo Group, JUXT and AMPt in 2011, other like-minded groups of individuals came together this year to start up communities of their own, or initiate collaborative projects. A selection of photos from tinycollective.com's home page. Indeed, legions of mobile shooters all over the world continued to find each other online through photo-sharing services like Instagram, EyeEm and Flickr in 2012. But many gatherings happened in person, in the form of “Instawalks,” EyeEm Meetups and other events. Like-minded people in various cities -- whether they viewed themselves as pro photographers or casual hobbyists -- bonded over their love of sharing photos through various popular apps and social networks. 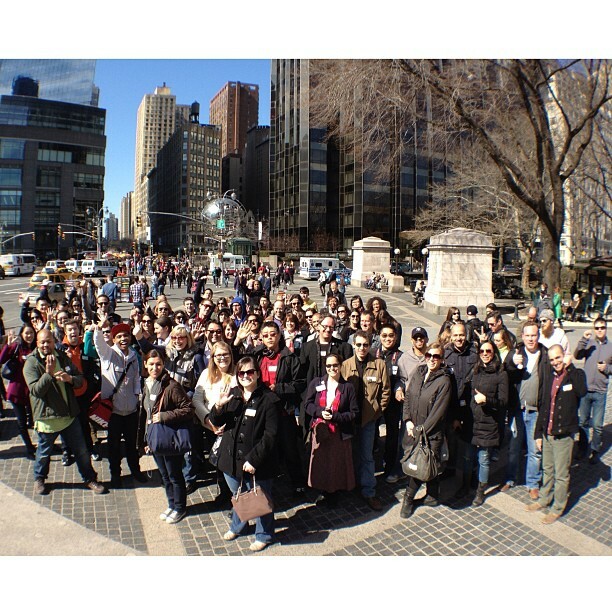 The InstagramNYC group poses before an Instawalk through Central Park. Photo by Brian DiFeo, using an Olloclip. 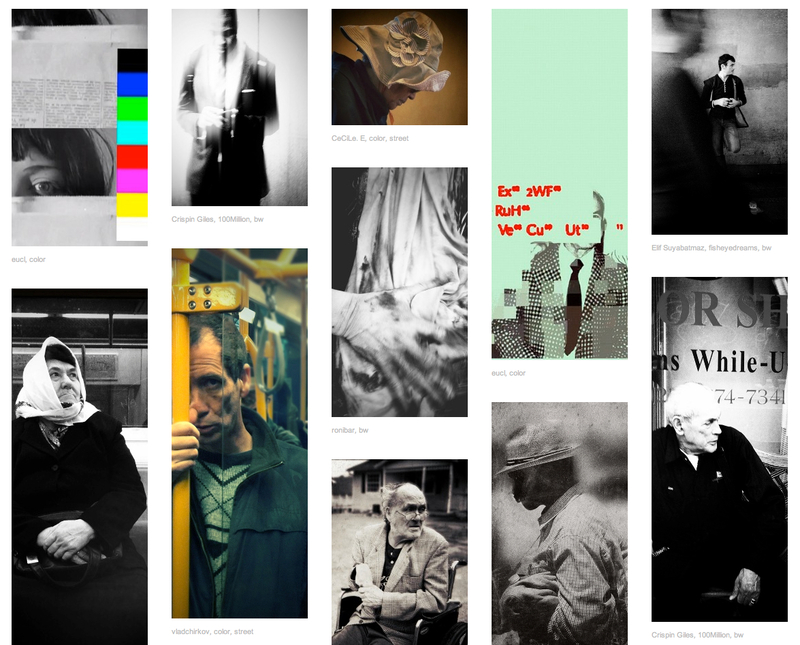 "Ambassadors" -- EyeEm's program for local photowalks/meetups around the world. 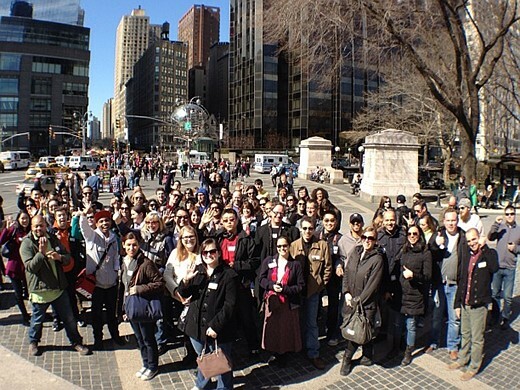 Fans of the Instagram app weren’t the only mobile shooters meeting in person in 2012. Photo-sharing service EyeEm (which pre-dates Instagram) got in the game this year too, and encouraged more social interactions amongst users. “What started as a little blog and exhibition in 2010 has grown into a worldwide community in 2012,” says EyeEm’s Community Manager Severin Matusek. “We had EyeEm Meetups in over 30 cities, updated to version 3.0 in September, kicked off our weekly photo missions, passed 1 million downloads in November and rolled out the EyeEm Ambassador program in December.” That program -- which appoints people around the world to be “ambassadors” for their respective cities -- is a concerted effort on EyeEm’s part to promote more meetups and local photowalks. These real life meetings of mobile shooters -- whether online, in an app or in person -- have spawned creative collaborations as well. On March 24th, Sam Smotherman (@whittiersam) and Renzo Grande (@aliveinnyc) spearheaded an ambitious undertaking entitled “The 24-Hour Project” that mobilized many members of the mobile photography community for a single day. 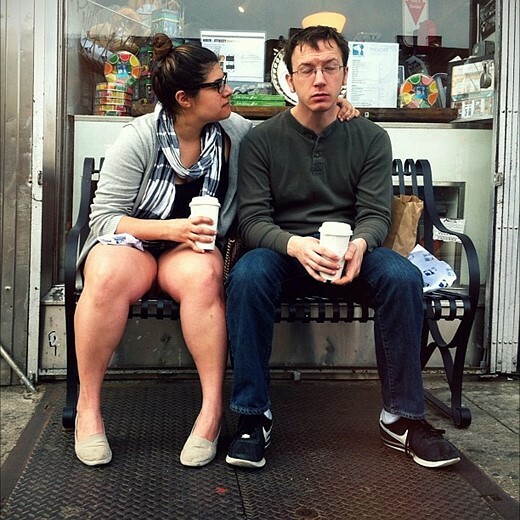 "(10:35am) The Morning After Talk" by Renzo Grande, from The 24-Hour Project. Smotherman and Grande hope to have a book of the project published soon, and are currently seeking sponsors for a photo exhibition of the project. In June, Mobile Photo Group member Star Rush, along with Jennifer Inslee, co-founded the online magazine Lys Foto for connected photography. "Image by Theodore Kaye, from Lys Foto Magazine. 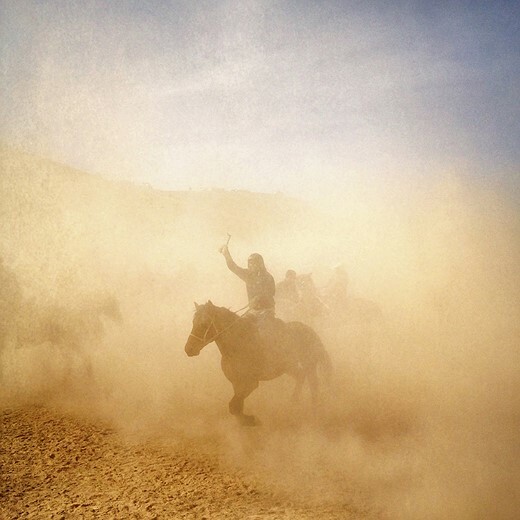 A buzkashi rider emerges victorious from a dust cloud. Popular throughout Central Asia, buzkashi is a form of horse polo played with a goat carcass for a ball." Despite becoming the biggest and fastest-growing mobile social network ever, mobile photo sharing platform Instagram started the year as an iOS-only platform. All that changed in early April when the app finally announced an Android version that would make Instagram available to a much larger audience of smartphone users. At the time, the app had 30 million users, but Instagram announced it had grown to over 100 million users just six months later. Not everyone was thrilled to learn the previously iPhone-only app would now be enjoyed by tens of millions of more users. In fact, some faithful users got downright nasty about having to “share” their app with a brand new crowd. Just a short week later, one of the biggest news events of the year happened when social media giant Facebook acquired Instagram for a whopping $1 billion dollars. Every tech, social media, culture and finance blog or news site was talking and reporting about it, while debating whether or not Facebook severely overpaid for what was essentially a “free” app. Since the app was free, and didn’t offer any in-app purchases, many often wondered how it would ever be monetized. With Facebook’s new involvement, many more feared that Instagram would ultimately go down a similar route as its parent company by introducing some sort of advertising into its model. Even more protests occurred, bigger than the Android backlash, and there were many cries of “I’m quitting Instagram” and “Facebook will ruin everything” across the Internet, as well as within the app. What once seemed like an “indie” community, and a tight-knit personal experience, was now becoming too big, too mainstream, and all too fast. The creators of Instagram insisted that nothing would radically change in 2012, and indeed the app remained much the same, with only the usual, expected minor updates now and then. The Facebook deal didn’t actually go through immediately anyway, and took several months to ultimately finalize. But after it did, Instagram had another shocking announcement to make to its users just as 2012 was coming to a close. While the last few years have seen an increase of photographers booking actual paid gigs using only a mobile device, these occurrences have still been quite limited -- as many companies and agencies that would normally employ the skills of a photographer have showed little faith to the idea of mobile imagery. But as platforms like Instagram grew to incredible proportions, some users (who were lucky enough to be put on Instagram’s “suggested user” list early on) saw their follower count skyrocket to tens of thousands, and sometimes hundreds of thousands of followers. Suddenly, companies began to see a new way of using social media outlets and mobile-based images to get more eyes on their products and services. Not surprisingly, a few entrepreneurial Instagramers who had made that “suggested user” list early on jumped at the opportunity to work with these brands. One of the more high-profiled examples has been The Mobile Media Lab -- a New York-based outfit consisting of Instameet organizer DiFeo, as well as Instagram users Liz Eswein and Anthony Danielle, who have all advertised for numerous brands on their highly-followed feeds. The practice, which has definitely sparked some controversy and debate by other Instagramers -- both pros and casual users alike -- has succeeded in many cases, and backfired in some others. Because the Instagram experience has been mostly about sharing only personal, user-generated content, no one wants to feel like they are being subjected to unwanted advertising. Eventually Instagram took notice: “Lately, we’ve noticed more sponsored posts and commercial content appearing in suggested users’ feeds,” they said in a message to people on this list in July. “While we’re excited that people have a large enough audience to start experimenting with this, it’s not the type of content we envision being the right experience for new users.” Instagram eventually made significant changes to their “suggested user” list, cutting it down by more than half, and adding more celebrities and brands to it. Many companies decided to forgo the use of known Instagramers this year and try their hand at the mobile image market on their own -- often hiring little-trained interns to provide content, sometimes with disastrous results. 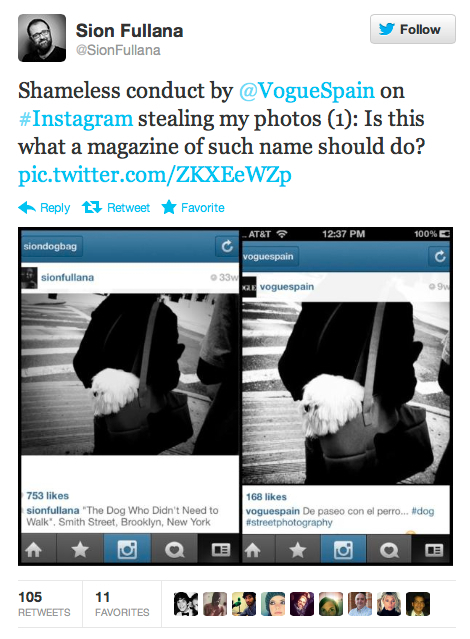 One such company was Vogue’s Spain branch, which became embroiled in a PR nightmare in April when they were caught stealing images from well-known mobile street photographer Sion Fullana (who happens to be this author’s husband). Vogue Spain later publicly apologized for the incident on Twitter (putting the blame on an intern), and compensated Fullana for use of his images. This tweet from @SionFullana highlighted the disastrous things that can happen when a company doesn't handle their social media correctly. Power-user Mal Sherlock (@fashion) has taken a more subtle approach to insta-advertising by incorporating Burberry fashions in his feed. Sherlock believes there are better ways for brands to take advantage of mobile photographers that would be more beneficial to them in the long run. Aurora Michavila, a popular Instagramer and brand strategist from Madrid, understands that finding the real influencers is a challenge for a brand that wants to stand out on Instagram -- but she also doesn’t believe that finding users with high follower counts is the only answer. Not all believe there’s much money to be made in mobile … just yet. Travel/lifestyle/stock photographer Jack Hollingsworth has been an enthusiastic supporter of mobile photography this past year, and has been carefully crafting an aggressive monetization strategy that he predicts will pay off big in 2013. Hollingsworth does see major revenue potential in related apps, books, consulting, workshops, etc. -- and many mobile shooters have indeed been taking that approach in terms of making money this year. Fullana (along with myself) started the Mobile Photo Workshop earlier in the year, where beginners and more advanced users could be provided valuable one-on-one feedback on their photos, and learn exactly what “works” and what doesn’t. 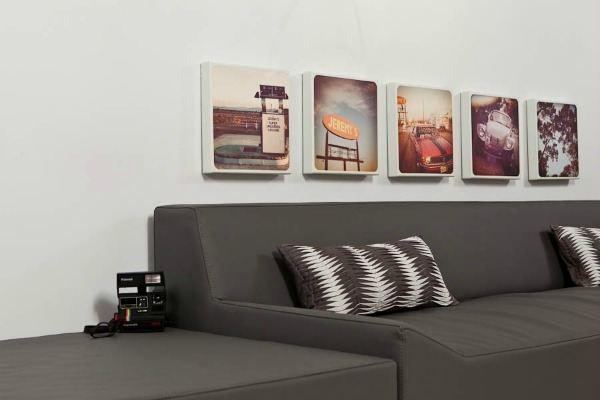 Canvaspop was just one of many companies taking advantage of the Instagram printing craze in 2012. This was also the year that many companies took advantage of people’s desire to turn their images into real, tangible objects. While some printing services had been around for well over a year, 2012 seemed a major turning point for most -- as demand for prints and other photo gifts reached an all-time high. Sites and/or apps such as CanvasPop, Postagram, PostalPix, Blurb, Mopho, Printstagram, Shutterfly, the Hipstamatic Printlab and many, many more scored big this year as mobile photo enthusiasts were able to turn their images into regular prints, canvases, metal/wood art, magnets, tote bags, cases, books, T-shirts, stickers, pillows … you name it! This was also the year that empowered people to sell their own photos, through InstaCanvas or Instaprints, and others. The prospect of potentially making a profit from taking mobile photos proved enticing for many people, and these sites became flooded with users hoping to cash in. But many were critical of these sites that seemed to be open to just about anyone, and with no real curation of the users or images. Most such services were also limited to Instagram photos only (a problem when you consider the 612x612 pixels size of the images). Even more problematic was the fact that users who uploaded their photos for sale often had the option to include their entire Instagram feeds for sale, and many surprisingly agreed to this -- not seeming to care if that meant including pics of their lunch, their pets, a screenshot of a text conversation, a self-pic in a bathroom mirror, or any number of shots that most strangers wouldn’t want in their homes even for free. Some sites, like Hashpix, did limit the number of artists and images, though it remains to be seen how successful these sites will be in the long run. Since the boom of mobile photography began a few years ago, enthusiasts have been insisting that images taken on mobile devices should be judged by their content, not their quality. Before this year, most smartphones and connected cameras yielded photos that were still considered too “lo-fi” for not only serious photographers, but also for publications to use them. Perhaps the most unexpected camera phone to be unveiled this year was the Nokia 808 PureView -- a smartphone that made headlines all over the tech industry with its unprecedented 41-megapixel image sensor (with a maximum output resolution of 38MP). Unfortunately, the device also runs the near-defunct Symbian operating system, leaving it undesirable as a “connected” device for most people. Android phones definitely upped their game this year, with standout cameras seen in the Samsung Galaxy S3, the HTC One X+ and the Motorola Droid Razr Maxx HD. Despite impressive tech specs for these devices as cameras, though, the Android Marketplace still lacks a satisfactory number of camera and editing apps. Most developers working on image-related apps tend to favor the iOS platform, as there is only one camera (per cycle) to develop for, as opposed to the dozens of various Android handsets with varying qualities and sizes of lens. 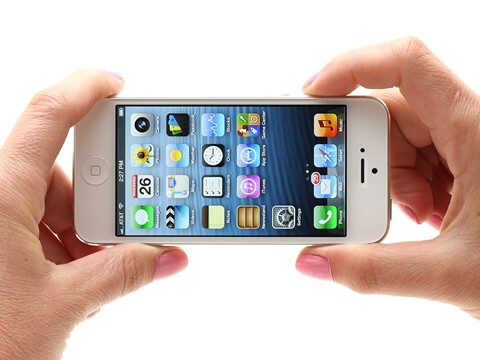 The iPhone 5 was introduced with much fanfare in 2012. Despite a smaller share in the overall handset marketplace, Apple’s iPhone remains king as far as mobile camera devices go, continuing to dominate by producing the overwhelming majority of mobile images this year. The long-awaited iPhone 5 was finally launched in September to much fanfare, and while the camera kept the 8 megapixels of the previous 4S, it included several improvements such as 40 percent faster image capture, better low-light performance and improved noise reduction. Apple also introduced a fun feature in iOS 6 (available on 4S and 5 devices only) that allows users to take quick and easy panoramic photos on their phones. The combination of great camera and literally thousands of photo-related iOS apps has kept the iPhone at the forefront of the mobile photography movement -- and it may be a while before a new device will be able to knock it off its throne. One of the earliest and most prominent apps that played a key in the mobile photo revolution is Hipstamatic -- which Apple named “App of the Year” in 2010 (which was also the year the app garnered mainstream attention when New York Times photographer Damon Winters used photos taken with Hipstamatic to illustrate his front-page piece on the Afghanistan war). Hipstamatic had long been one of the most well-known apps associated with mobile photography, but Instagram’s overwhelming popularity in 2012 eclipsed the former app’s reign. At the end of the day, while both apps could be used to take photos, Instagram was more about the social sharing experience, while Hipstamatic’s goal was always about making beautiful images. Hipstamatic laid off almost half their staff (all new hires) in August. While the move got a lot of attention around the Internet, the company’s creators ensured that it was all done to bring the company back to the core of what it felt it did best. The September issue of Hipstamatic's Snap Magazine. That focus was definitely on full display when Hipstamatic launched their free iPad magazine called “Snap” in May. The magazine quickly became the #1 photo and art publication in the App Store, and later became available on the iPhone and web in November. The devastating hurricane that rocked portions of the Caribbean and eastern coast of the U.S. this past October was one of the deadliest on record -- resulting in hundreds of deaths and several billion in damages. It was also one of the most photographed natural disasters in history, with the majority of images coming from mobile devices. The original Hurricane Sandy image by Ben Lowy, from Coney Island Beach, Brooklyn, that was used for TIME Magazine. Instagram reported that during the height of the storm and aftermath, an average of 10 Sandy-related images were shared per second on their service using just the hashtag “#sandy” alone. (Interestingly the hashtag was used once again for another recent tragedy: the school shooting in Newtown, Conn. -- as the school was called Sandy Hook Elementary). Other tags used for the storm included “#hurricanesandy” and “frankenstorm,” and numerous variations. Unfortunately a good number of these photos were reposted news images, photos that simply used the hashtags in an attempt to gain more exposure, or even completely fake images altogether (many of which got circulated as “real”). Mobile Photo Group member Misho Baranovic was concerned about the number of fake and non-relevant Sandy images he was seeing, and decided to do something about it. Using Nitrogram, an Instagram moderation tool, Baranovic created a custom, curated feed of legitimate Sandy photos for the Mobile Photo Group’s blog, which other MPG members helped with. The feed proved to be quite popular for people hungry for real imagery of the storm and its aftermath, and it even temporarily brought the Mobile Photo Group’s website down numerous times. The experiment definitely made a case for more curated content, though -- and it’s expected we’ll see more of such experiments in the future, when major news events get covered by everyday users using their mobile devices. Image from Union Beach, New Jersey by Ruddy Roye -- one of the many pieces from the fundraiser for Hurricane Sandy victims. Weeks after the storm hit, many people were still without power and resources. Several photographers who had used iPhones to capture the effects, aftermath and human stories related to the storm contributed to a Sandy relief exhibit fundraiser in November, at the Foley Gallery in New York City -- which raised more than $20,000 to help those in need. Curated by Jun Lee, the photographers featured in the show included Lowy, Ed Kashi, Stephen Wilkes, Wyatt Gallery, Hank Willis Thomas, Michael Christopher Brown, Craig Wetherby, Yosra El-Essawy, Sam Horine, Nicole Sweet, Dylan Chandler, Brent Bartley, Stanley Lumax, Varenka Ruiz, Lyle Owerko, Erica Simone and Ruddy Roye. Roye, a Brooklyn-based documentary photographer whose been working in the field for over a decade, but has only recently taken to shooting on his iPhone beginning this year, was pleased by the results of the fundraising exhibition. EyeEm continued to attract mobile shooters who were more interested in consuming just good photos instead of building a follower base, while adding new camera and sharing capabilities with their 3.0 update. Photo-sharing site 500px concentrated their mobile efforts on a new app that debuted in November. New apps, like Starmatic, impressed many users with its attractive, streamlined interface. Even Twitter got into the photo-sharing game by updating their mobile app to include photo filters (although the general consensus on them was not particularly favorable). One of the biggest surprise comebacks, however, turned out to be Flickr. Once the premier space for sharing photography, Flickr unfortunately lost some relevance when the advancement of mobile photography entered the scene as the site failed to take advantage of the new medium for a while. Because many mobile shooters disliked Flickr’s clunky previous attempt an app, most flocked to Instagram and other services -- leaving Flickr in the dust for more than two years. But when Flickr finally unleashed an updated version of their app earlier this month, bringing most of the website’s most popular features to it, and within an attractive, easy-to-use interface, old Flickr-devotees (as well as new users) rejoiced. While it took way too long to get this update out, the changes were quite welcome -- and interestingly enough the most excitement came from simply incorporating features that the website had all along (including support for Sets, Groups, multiple levels of Privacy, and so much more that Instagram lacked). You can read more about the app in Connect’s app review, or my own breakdown on the Mobile Photo Group’s blog. There’s no question that Instagram has been the “big kahuna” in the world of mobile photography for over two years now. It’s been impossible to talk about Instagram or mobile, without bringing up the other. So whenever there’s big news about Instagram, it’s bound to send shockwaves throughout the mobile community. Facebook buying the app for $1 billion was the first major big news of the year. Then earlier this month, Instagram yanked the ability to have their photos integrated into Twitter’s service -- causing lots of confusion and head-scratching for the millions of Instagramers who enjoyed sharing their photos on the micro-blogging site. But that wasn’t the only Twitter-related trouble the company got into. The New York Times reported that Instagram’s CEO Kevin Systrom’s sworn testimony to California state regulators didn’t quite add up -- and that when asked if his company had received any prior offers to buy Instagram, he said no. But reports actually showed that Systrom had verbally agreed to sell Instagram to Twitter for $525 million back in March, and then later canceled the deal. But it was the ultimate consequence of the Facebook acquisition -- an announcement of forthcoming changes to Instagram’s Terms of Service -- that caused the biggest uproar yet amongst Instagram users. On Dec. 17th, the folks at Instagram sent a notice to all of the users of the app about changes that would be taking place on Jan. 16th, 2013. The language basically described how Instagramers' photos could be potentially used in some form of advertising in the future. Many users, and even media outlets, completely misunderstood the terms -- or simply never read them in the first place and were reacting to other people’s reactions -- and initially thought that Instagram was giving themselves the ability to actually sell users’ photos, and not receive any compensation for them. Instagram quickly made a statement on its blog saying they were misunderstood -- but that didn’t convince everyone that their policy was really changing about using photos for promotional reasons (which is still quite a concern for most people). Millions of users were quite justifiably upset at the news. Even celebrities such as Kim Kardashian, Pink, Anderson Cooper, Olivia Wilde and Seth Green reacted negatively to the new terms. National Geographic and several other major content providers said they would suspend their feed until further notice. Photographers, most of all, would be affected most by the change and let their dissatisfaction and concerns be heard. Many users gave "goodbye" messages to Instagram after the new Terms of Service were released. Some just left black squares to signal the end of their uploading of new pics. While some of these users returned after IG reverted to the old ToS, many users have stayed off and haven't come back. Users reacted by posting protest pictures (most often just a black square), and said that they would refuse to upload more photos until Instagram changed its policy. Others abandoned Instagram altogether, downloading all of their images using services such as InstaPort before deleting their account altogether. Even when Instagram posted up an updated TOS based on users’ feedback (which was almost exactly what they had before), it was too little and too late for some, and many felt they couldn’t trust Instagram ever again. So what's to come in 2013? We’ll see more mobile exhibits, more people making money with mobile images, more conferences and exhibits, more awesome devices and probably more controversies -- that’s for certain. But what remains to be seen is that “X” factor -- that single app that might take the mobile photography community by storm, or that cultural shift that completely turns our lifestyle upside down, again. If the course stays on the same path as the last couple of years, we should definitely prepare for some exciting times, and surprises, ahead. On thing’s for sure: the medium isn’t going anywhere: "I think that we've put the final nail in the coffin on the debate over the value and validity of mobile images,” said Hernandez. “If you're still talking about it, you're beating a dead horse! Photography is photography is photography no matter the device." Anton Kawasaki (@anton_in_nyc), has become known for his intimate and candid street portraits, which capture the people of New York in "moments" that express love, despair, humor, and the multitude of emotions that make up daily life. His images have been featured in several magazines and in exhibitions in various cities around the world. He co-teaches a series of online workshops on mobile photography, and is a visual storyteller/mobile photographer for hire. 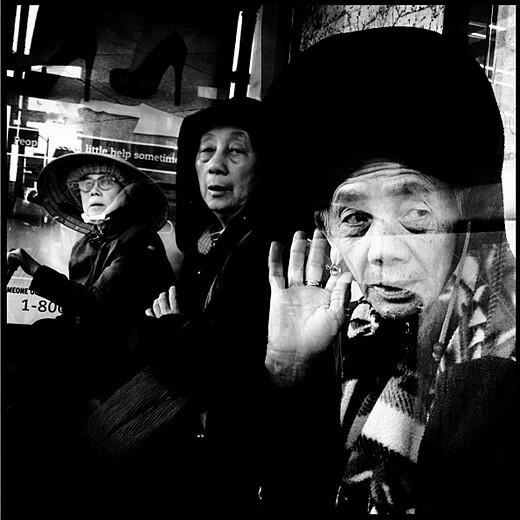 He currently resides in Brooklyn with his husband Sion Fullana -- a pioneer in the mobile photography movement. Use Galaxy S3, it has wider lens and better low light and faster speed and image stabilizer. And quad core for processing image is miles faster. Especially if 2012 is the year of mobile photography, it's revolting that Ben Lowy wasn't even credited on the Time cover. The writer was, for a piece that not even a single word of which even appears on the cover. Yet the photographer's entire (cropped) work appears, we need to open the book to see it. Also while I love the Time cover I FAR prefer the original image! A well written article indeed. Excellent examples of the work being done as well. Fantastic survey of what is one of the most democratic (and exciting) area of photography right now. There is no doubt that as sensors improve, smaller ones suffice. Also, regarding Hipstamatic, whilst I often wish they'd let me simultaneously save a 'normal', unfiltered photo, there's also no denying that making it a one-off capture is a very powerful approach and one that get's me using my iPhone camera more. I'd venture to say that their photos get almost no post-processing other than the app's processes- a rare thing in the often convoluted 'workflow' of digital photography. Also, regarding Instagram, I think they really were planning to use user's photos in advertising, though maybe not sell them per say. Luckily they backed down and people like me were able to keep their account going. Also, like a lot of people I use it more to share DSLR/compact photos rather than mobile ones. For me mobile photography is more about the sharing than the taking. Really great and detailed overview of the year, Anton. What a year it's been! Just one small quibble. Saying people "misunderstood" the new IG terms is way wide of the mark. They understood them too well: that's why there was such a furore. To quote the proposed (now removed from the internet) TOS: "... you agree that a business or other entity may pay us to display your username, likeness, photos (along with any associated metadata), ... without any compensation to you." It was crystal clear. Also, if people had misunderstood, why were they "justifiably upset"? Instagram's attempt to portray it as one huge misunderstanding remains a reason why people are still wary. It was a PR disaster for IG and I'm sure many brand analysts have knocked quite a few hundred millions off that $1bn valuation. The bottom line now is people realise IG will eventually end up using our photos for something we don't like. And they lost a lot of trust - and are still losing it by pretending nothing happened. I'm moving over to Flickr for various reasons: friendly TOS, full-res uploads, serious photography place, less of a likes/follower numbers culture, cool new mobile app. You over there? Yes, I saw you stopped posting on IG. Or you going somewhere else? At least it's made for an interesting time in the mobile world. Looks like you found me on Flickr! That's where I will be mainly sharing photos from now on (other than my own website). The mobile Flickr app is great, and what I've been waiting years for from them. "Mobile photography"? What's new? Photography has been mobile for as long as I can remember! Pocket sized cameras go way back to the early 20th century. Perhaps you mean "mobile *phone* photography"? No he meant mobile photography. It has become the accepted term for photographs taken with a mobile device. It's not constrained to a phone any more. Not constrained to a phone? Of course it is. This artificially-created movement is all about heavily-filtered images taken with a iphone, Samsung Galaxy, Nokia, HTC or other mainstream phone. The filters aren't even the photographers own work, rather are the same retro-zeitgeisty presets we see in every single image posted here. Had these images been presented in a regular camera community, they would be criticised for all having the same boring emotional tone, as well as their technical deficiencies. Normal photography, with a camera as the photographic tool, is mobile too. Depending on the size of the camera and lenses, some are more mobile than others. "Phone photography" is arguably the most mobile, as the thin nature of phones mean they handily fit in pockets. But going by the accessories we see touted on these pages, 'mobile photography' can be just as cumbersome to lug around as proper photography gear. If this movement is to survive, it has to mature into an artform. "This artificially-created movement is all about heavily-filtered images taken with a iphone, Samsung Galaxy, Nokia, HTC or other mainstream phone." No, about it's post processing time taking another exponential leap in speed. Any device that can photograph and directly publish a finished image is welcome. "The filters aren't even the photographers own work"
So you made your own film back in the day? Dyed your own filters? "Normal photography, with a camera as the photographic tool, is mobile too." Missing the point again. With a traditional camera, post processing is not instant and mobile. "If this movement is to survive, it has to mature into an artform." There is no question of survival. Many more people are practicing mobile photography than traditional photography, and the difference will continue to grow. A more appropriate question is in what form will traditional photography survive. Your replies read a little desperate. Seems the 'mobile' community can be just as defensive about their gear as 'traditional' camera geeks. "Any device that can photograph and directly publish a finished image is welcome." This is not interesting for most photographers. This is only interesting for social networkers and working photo-journalists. "So you made your own film back in the day? Dyed your own filters?" No, but I shoot straight-out-of-cam JPG's that require no post-processing. I use natural light, the lens, in-camera processing and perhaps a glass filter. This is my unique composite image. Phone photographers don't create such a thing, they copy. They use the artificial light a popular filter lends to an image, rather than learn how to use real light. "Missing the point again. With a traditional camera, post processing is not instant and mobile." No, you're missing the point. You're assuming this is important. But even then, 5-year old Pentax DSLR's have allowed in-camera post-processing. Photographers didn't care for it then, and they don't care for it now. "Many more people are practicing mobile photography than traditional photography,"
If you count the millions of Facebook snaps that end up online, then yes more people are taking pictures with their phones than people with proper cameras. But if we are to define "photographer" as someone who is creatively recording images, then no...phone photographers are in a huge minority. Just look at the attention Connect is receiving when compared to the 'traditional' dpreview camera site. The reason you phone photographers are being belittled by your camera-peers is because you've artificially created a scene and are announcing it as the best thing ever. "Phone photographers don't create such a thing, they copy. They use the artificial light a popular filter lends to an image, rather than learn how to use real light." That's not an accurate statement. There are many mobile photographers that have a firm grasp of natural light and use apps such as ProCamera to carefully control their exposure levels - often with as much accuracy as a DSLR. I don't think it's up to you to define who is and isn't a photographer. DPreview has been around for 15 years compared to three months for Connect. Not exactly comparing apples with apples. Over my three years practising mobile photography I've never been belittled by a professional photographer. That seems to only happen on forums by people who feel threatened by the changes that are occurring within the medium. The odd few photographers who do use phones are the exception which prove the rule that the vast majority who use phones to take pictures are snapshooters, all using the same populist filters. The problem is the almost religious belief that phone cameras are taking over the world, leaving normal cameras in their wake. It's ridiculous, and everyone apart from a couple of cultists knows it. Not sure what you're trying to say in the first sentence. Yes, the vast majority of people using their phones are taking snapshots, as are most DSLR owners. There is no religious belief, just an inquiry into how connected cameras continue to alter the way we communicate through pictures. But you don't have to worry to much, the ease of editing and sharing we've so cultishly embraced will be coming to most 'real' cameras in the next year or two. Then it will all become photography again. But, surprise, surprise most will be sharing their connected DSLR or 4/3rds photos through the same apps and same filters. "most will be sharing their connected DSLR or 4/3rds photos through the same apps and same filters." See what I mean? That's what I'm talking about. Where do you even get this idea from? Serious photographers aren't interested in me-too hipstery digital filters or sharing every single snapshot they take in some social webcloud. I prefer mobile camera to DSLR. Who wrote this? This is a great article! I am struggling with the concept of mobile photography. I'd love to embrace its immediacy and intimacy, but I can't get around its technical limitations. Blowing up a phone shot to anything larger than A4 would require a huge dose of explaining to myself that the graininess is an "art form," not a limiting factor. Many peers have produced excellent images that look great online, so I am not doubting its place. I just cannot fathom it being a "real" alternative to the DSLRs that feed us. Would someone cover a presidential event with a phone, or with a top-of-the-line DSLR? Probably not, and that's my biggest problem. I've printed clean A3s others have gone larger. Worrying about how large you can print is limiting in itself. Yes many photojournalists cover events with both their standard camera and a mobile phone. I doubt that many people think of mobile phones as "an alternative to the DSLRs." There's no reason to limit yourself to just one or the other. I have a DSLR, a compact, and a mobile phone. I use all three as I see fit. For me, the mobile phone is for snapshooting. Not all picture-taking needs to be Photography-with-a-capital-P. Sometimes you just want to a pic of what you're up to at the moment, to share with family or friends. In any event, I don't print anything, not even from my DSLR. Whether it'll look good in a very large print simply isn't relevant to me. That's a very immature way of thinking. Art is all about technical limitations. 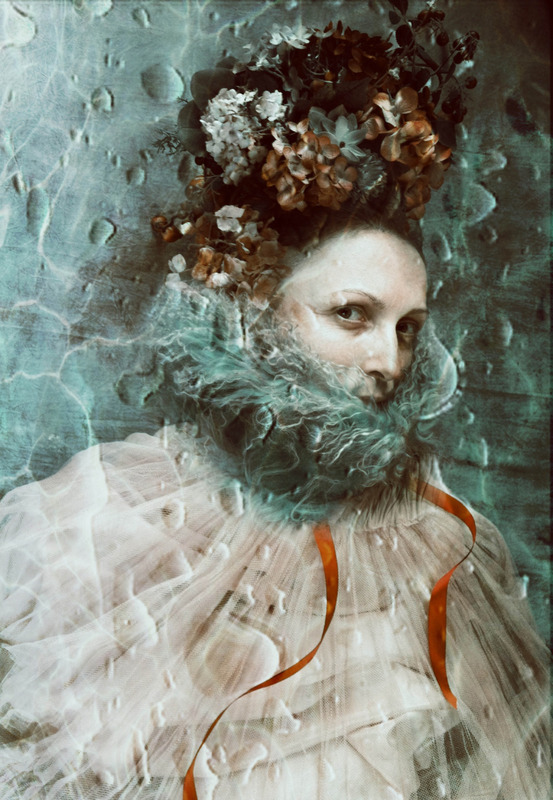 When an artist picks a particular medium or artistic technique, he wants to challenge himself in spite of the technical limitations. If you have a "problem" with that, then you really don't understand art. If you acknowledge its "immediacy and intimacy" but are willing to dismiss that because it can't stand up to the rigors of "technical" pixel peeping, then you really have your priorities screwed up. Do you also dismiss the works of Frank Capa or Henri Cartier-Bresson because their works don't match the "technical" level of a DSLR? Anyone who is more interested in measuring the "technical" aspects of a piece of artistry rather than enjoying the emotional aspects of it really isn't an art lover; you're a "technician". Sadly, there are all too many people like that in photography today, more interested in the quality of the pixels, rather than what the cumulative pixels convey. At the Mobile Photo Awards exhibits we've printed and sold images as large as 20x20 and 18x24 - it depends on the image. A collector isn't concerned about pixel peeping, they're interested in great pictures and great storytelling. I think that's a harsh response to dash2k8, I'm a photography major and I'm well acquatined with the art world. I think what you fail to address in your response is the art of craft. In that regard mobile photography lacks what certain photographers value dearly. Cartier-Bresson and Robert Capa would have been using DSLRs if they had been available, they were using the newest and most specialized equipment of their time that suited their shooting style. Fine art photographers choose the tool that best suit his or her artwork and ultimate goals. The technical aspect of a true piece of art should complement and be a product of decisions made by the artist. Ansel Adams would never have used an phone 5 and sports photographer would never dream of using an 8x10 view camera. Mobile photography represents a new level of accessibility in photography not a triumph in image quality. A way to get a camera in everyone's hands and evidently some talented ones. @ tarena91- That's like arguing that art really depends on the quality of the paint brushes or chisels used! LOL. Or that's like arguing that true "artists" value the quality of their paint brushes and chisels above all else! The reality is that the tool used is far less important than the end result produced. If you only are about the "technical" aspects, then you might as well be in the field of "manufacturing" rather than art. Also, art isn't about conformity to a set of parameters (ie, "technical" parameters). What you're arguing is a degree of conformity that is the anti-thesis of art. In our pursuit of so-called "technical" excellence, people like yourself choose to dismiss an entire genre of photographic art simply because it doesn't stand up to scrutiny under a microscope, or in Photoshop at 100% magnification. And in doing so, you essentially "miss the forest for the trees". You are championing a "triumph in image quality" over what the image speaks to the viewer. @tarena91 - I strongly recommend you look at the photo collectors market. What you will find is photos that are being collected, and that were produced by a huge gamut of photo-capturing tools, and showing a huge gamut of so-called "image quality." It's the photo that matters far more than the technical aspects of the camera that produced the photo, or how well the photo looks at pixel-level magnification in Photoshop. These photo collectors aren't saying, "Yeah, it's a great photo, but was it captured on a DSLR? How many megapixels was the camera?" I just printed a mobile shot captured with Hipstamatic and heavily edited with mobile apps at 20 in x 20 in. There are ways to improve the resolution with non-mobile apps such as Photoshop to get it that big without any degradation to the quality. So don't let that stop you. Use the camera that best lets you get the shot - in my case its an iPhone. no no T3 you misunderstand what i'm saying. I agree with you on most points, simply that in many cases, quality or lack of quality is used intentionally to complement what an artist is doing or the artist's motive. It's important to understand your tool and what it does! It boils down to the photograph as a photograph yes that's a GIVEN but you cant look me in the internet eye and tell me that photographers are not unique in that their tools have a direct effect on the outcome of their work. certain tools are better suited for creating certain types of art. I'll use my medium format Hassy if im shooting landscapes, i'll use my iphone if im out with friends and photojournalist type things, i'll use my D800 if im in the studio, could i switch them up and shoot the same subjects...yes but they would provide me with drastically different asthetics and arguably different emotional tones and subtleties. Photography is more complex than you give it credit for. this isnt about quality, it's about using what's best for what you want to do, something every artist must think about. T3, art is what art is, is what it is to the "artist". i'm an artist & designer and i will say the only thing stopping most ppl from peddling their stool samples as art is the self critical assessment that the artist has put enough rigour into his work for it to be art. art itself is too undefined so we have to provide boundaries so someone doesn't go & sell his stool(literally) as art. i'm very critical of art. i won't just accept it at face value. an idea that is captured but poorly executed is still a poor work of art. it shows a lack of commitment and rigour and critical thought and frankly it is lazy. just as you should be able to tell the artist used the wrong tool to tell his story or the painter used the wrong brush and had a blatant disregard for his tools. there are a lot of great mobile photos out there but also just as many "great" photos where it clearly shows the artist/person ran afoul of his tools. the problem when any artist defines himself as "mobile photographer" or any other arbitrary designation is, you will be judge on how you handle your self inflicted limitations. the proper artist does not so narrowly define himself/herself by their tools (as mobile photographers tend to do) but will use the most appropriate brush & technique require by what they are trying to do. otherwise the artist will be subject to criticism for his execution should his tool fail him. being on time magazine does not make it art anymore than if a bunch of snooty artists gathered around to declare it art. personally, i find the time magazine cover to be extremely poor for example. the idea is capture but the tool failed miserably. excuse me but you'll have to accept my painting where i was trying to capture a soft smile using an overly large brush and expressed with anger. it's art, just accept it. --- does that sound reasonable? i'd say not. Wansai - yes you find the cover to be 'extremely poor' but the photographer liked it, Time magazine liked it, many of the tens of thousands that shared the article and bought the magazine liked it. So, again its a case of opinion and judgement rather than tools. I'm struggling to see any miserable failure anywhere? "Art is all about technical limitations."!!!???? Glad you cleared that up. That sort of remark is tailor-made for this article. Technique is fundamental but hardly "all" by any criteria. Aye it's good fun allright, and i'm sure i can draw my phone and snap off a few pictures quicker than old clint drew his pistol back in the day. As for quality aye i suppose how it's printed what on makes a difference and all, heck my old sony compact at 5.1 megs prints up real nice. But the real fun involved in shooting film on a slr or using a dslr kicks any mobile photography experience to the kerb anytime anywhere that is the truth m'lud. "But the real fun involved in shooting film on a slr or using a dslr kicks any mobile photography experience to the kerb anytime anywhere that is the truth m'lud." Spoken like a true curmudgeon. Not everyone finds the "experience" of lugging around a DSLR all that fun. Besides, they are two entirely different experiences (mobile photography and DSLR photography). Who says one has to be more fun than the other? It's like saying that having a casual picnic in the countryside is a lot more fun than having a dinner at a fine restaurant. Two totally different experiences. curmudgeon?? Thanks for the compliment!! Say what you want my man, i frankly don't care. But mobile phone photography frankly is not there yet in quality terms. Argue as you will about the art and all that, truth is i do care about quality so do lots of people i imagine. No i dont lug around a dslr as you say, take what is needed, no need to walk around with twenty lenses! !